Historian, music aficionado and New York City native, Charles R. Hale narrates this musical tribute, transporting the audience back in time though personal recollections, intriguing anecdotes and glamorous stories of the artist and musical geniuses who created the Great American Songbook and made New York City the Jazz Capitol of the World. The program features singer, pianist, David Raleigh and his trio (Tony Cafora on sax, Danny Weller on bass and Daniel Glass on drums) Directed by 7 time MAC award winner, Natalie Douglas. 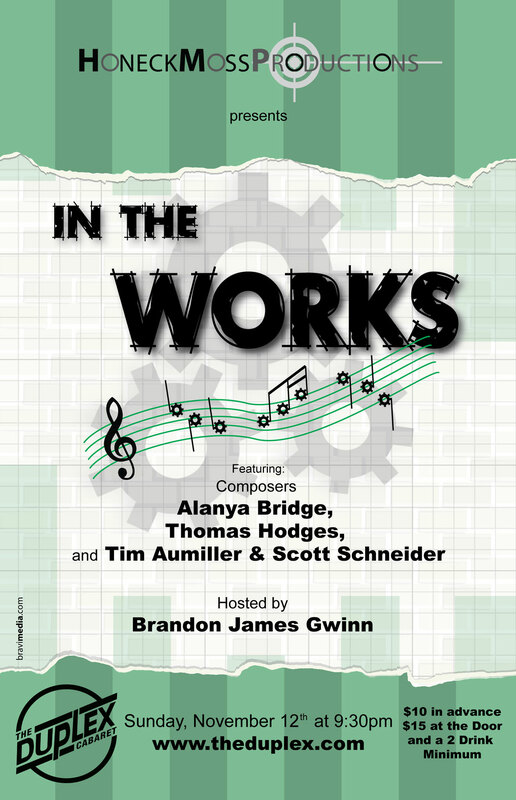 Honeck-Moss Productions is proud to present “In The Works.” This exciting series in in it’s second season and was conceived as an opportunity for composers to try out new work in front of an audience and see how it plays in a supportive environment. It is also an opportunity to create community among the composers, their performers and music lovers. In The Works will be presented monthly and feature three composers or composer teams, each presenting about 20 minutes of new material. This month features the works of composers: Alanya Bridge, Thomas Hodges, and Tim Aumiller & Scott Schneider. Hosted by: Brandon James Gwinn.